A rare lichen previously thought to occur only in Alaska, Oregon, Chile, New Zealand and Tasmania has been found thriving in the north west Highlands. Experts have been surprised by the discovery of the micarea prasinella. 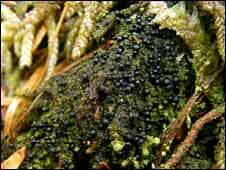 The black beaded lichen was spotted on the Dundonnell estate and is new to both Scotland and Europe. Although the plant has a scientific name, lichen expert Dave Genney wants members of the public to suggest a common name for it. Mr Genney, of Scottish Natural Heritage, (SNH), immediately recognised it as something out of the ordinary. He said: "This very neat looking lichen caught my eye with its dark green velvety carpet, dotted with shiny black fruits. "Its location at the top of the rock step probably protects it from over shading by bracken and from trampling. "I didn't recall ever having seen a photo of it before so I collected it because it looked distinctive enough to identify." Dr Brian Coppins, senior lichenologist at the Royal Botanic Garden Edinburgh (RBGE) was also on the Dundonnell trip, and was able to identify Mr Genney lichen straight away, as he remembered seeing it when he was looking at lichens in Chile. He said: "I was amazed to see this lichen that I had only seen previously on an expedition in the Chilean rain forest in 1986. "It is rare to find a new species to Scotland, but to find a new species to Europe is fantastic." Mr Genney and his colleagues are keen to encourage the public to come forward with name suggestions. He said: "The discovery of this lichen is another reminder of the wonderful biodiversity to be discovered and enjoyed in the highlands of Scotland. "It would be only right to choose a name for it reflecting the unique character and Gaelic tradition of the west highlands and we welcome all suggestions."